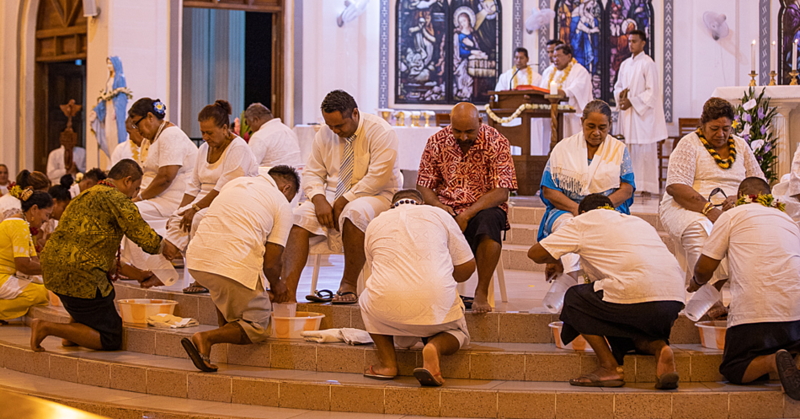 “Too many Samoans are lazy, and I do not exclude myself here. But we can use everything that is given to us, it’s as simple as that. People just need to know how”. As Malcolm Hazelmann speaks these words, he pours a juice consisting of starfruit, orange, papaya, lemon and water, that he just prepared with every ingredient coming from his own garden. A juice that with every sip tastes of the independence of home gardening. As Hazelmann finishes preparing the juice, he collects all the skin that is left over from the fruits and puts it in a bowl. “Everything that comes out of our kitchen will not be wasted. This goes straight back into the garden”, he explains. Hazelmann has seen the world throughout his life and more importantly, he has seen it through the eyes of an agriculturist. The man who did his diploma for agriculture at the University of South Pacific, his undergraduate and master’s degree in tropical agriculture and horticulture in Hawaii and his Ph.D in the United States, retired in 2003 from his position as a senior officer at the Food and Agriculture Organization in Hong Kong. Even though his background had provided him with all this knowledge that might have been sufficient for the world of academics, Mr Hazelmann searched for more. As he explains, in terms of agriculture, there is no better place one can learn more about the subject than a farm: “I am still travelling although I’m retired since a few years now, because for me, travelling is learning. I try to visit farmers everywhere. There is no better chance to learn as to witness the actual process”. One place Malcolm is visiting regularly, is Thailand, a country which has taught him a lot about gardening, since he had been working there for more than fourteen years of his life. “In terms of growing conditions compared to Samoa, Asian countries are the best to learn from”, he states. The knowledge Malcolm Hazelmann has gained, is what he is giving back to his home country: “I am in the giving back stage of my life at the moment, if you want to put it that way”. Giving back is indeed what Mr Hazelmann does. Three years ago, he started a group on Facebook, entitled “Mafaufauga”, which at this stage has more than 800 likes. On “Mafaufauga”, Hazelmann passes on his knowledge by sharing simple techniques of home gardening, which can be done by anybody. One of his recent ideas includes for instance the instalment of home gardening in particularly small spaces. “I often hear people complaining about having too small spaces for growing their own vegetables and plants, but nobody has to have a big garden to do so”. As a result, Mr Hazelmann presents plant tubs which he has created out of plastic bottles, or even pieces of Styrofoam which are held together by a sack. This kind of thinking can be found through Malcolm Hazelmann, as he points to the gutter, which is located right above his balcony: “First I wanted to fix it, but after a while I realized that with the rain water falling down in the garden, I could simply collect it to water my plants with it, because I found out that sometimes, the seedlings are killed by tap water as it might contain too much chlorine”. Mr Hazelmann even produces his own fertilizer for his plants, made of the leftovers of fruits, freshly mowed grass or the excretions of worms. But Malcolm Hazelmann’s way of sharing is not only restricted to the digital world of social media. Several times a year, he organizes activities for his own gardening group, called the “Informal Gardeners Group, with the next meeting coming up this Saturday. These meetings are only one of the many activities Mr Hazelmann initiated to teach about home gardening in Samoa. “I am speaking of activities, as the term project might indicate that I am funded by any kind of authority, but this is not the case. Everyone who is interested in learning more about planting their own vegetables or fruits is highly welcome. This year, we also started a plant and seed exchange on the group, so that people can help each other out in a better way”. 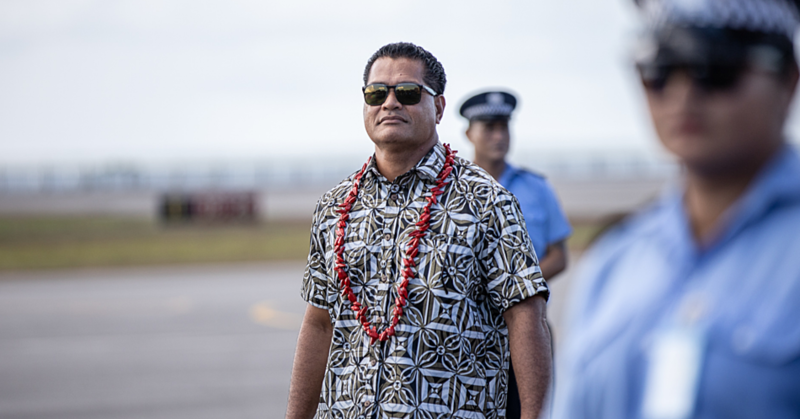 With his activities, he also tries to encourage local farmers in Samoa to learn more about certain techniques of farming. 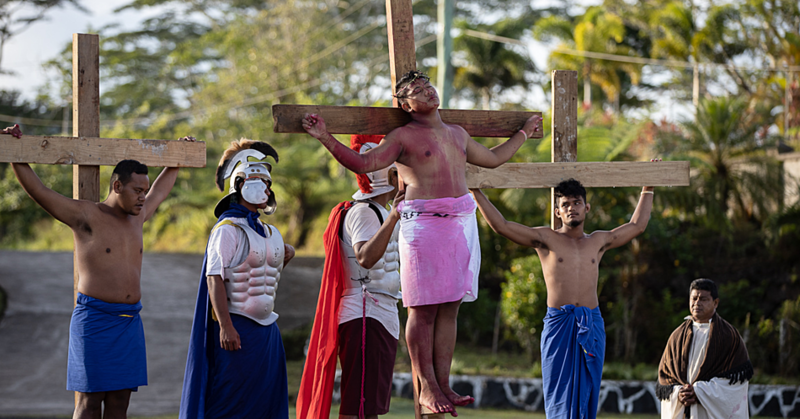 “I want to give back [my knowledge] to Samoan farmers, because quite often, here in Samoa, it seems like we have a postcolonial thinking which is based on the thought that ‘the palagi knows better’ and in the eyes of our own people, we’re never regarded as successful. So the foreigner is always better than us, no matter how trained we are”. But with the sharing of the knowledge he was able to accumulate over the years, Malcolm Hazelmann has proven this prejudgement to be wrong in a pretty clear way. In his own garden, which offers a vast variety of plants and trees, Mr Hazelmann has built up an impressive example for home gardening. It consists of a small patch of approximately eight feet in length. Covered by a net, this planting bed is used to grow many different kinds of plants, vegetables or spices. For instance mint, ginger or even chili peppers, growing out of a simple plastic bag. “There are over sixteen different eatable plants in here. All of them are grown by the composts we produce on our own”. 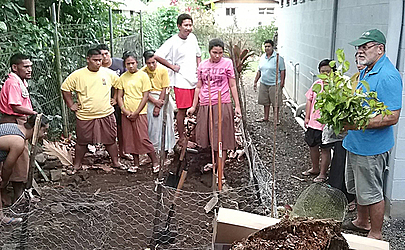 According to Malcolm Hazelmann, this way of gardening differs from what people are used to seeing from the Ministry of Agriculture and Fisheries in Samoa. “These are varieties the Ministry simply doesn’t have. They often used my postings on their own Facebook page, which is a good way to spread these techniques. I always tell the people that the garden at your home doesn’t have to look perfect with all these straight lines and things like that. But if you simply let it grow like it is supposed to do, it also looks very nice. Also, the most important thing is that you get something to eat out of this kind of gardening, that’s all that matters”. For Hazelmann, the term of passing on, is an important one, no matter if it is about sharing different kinds of seeds or ideas about farming, as he explains: “If people can learn something about gardening from me, they should also be willing to pass this knowledge on to somebody else, because why should they keep it for themselves? It didn’t come from them in the first place, it was already there”.